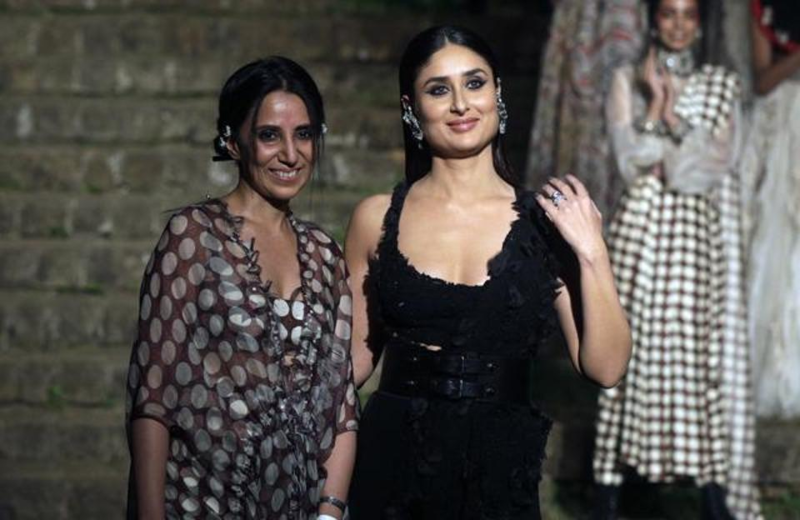 Actor Kareena Kapoor Khan closed the Summer/Resort 2018 edition of Lakme Fashion Week (LFW) as a perfect showstopper as she walked the runway for designer Anamika Khanna in a black outfit that was inspired by sari. “It’s a form of sari drape. We teamed it up with pants just to make it a little different and stronger,” Khanna said. Bandra Fort ended up being the ideal scene for the finale introduction with Kareena, who was found in the shocking dark weaved and spectacular dress adding more fabulousness to the whole introduction. “This collection is difficult to define and put in any bracket. It is very experimental using couture techniques. The inspiration is ‘the new millennials’, who are bold enough to wear their individuality on their sleeves. This time the mix of materials is done which has never been used before. A lot of fabric development and manipulation techniques are used,” said Khanna. “Using traditional zardozi in the most experimental ways and mixing various textile colours and print makes each piece one off. Not to forget, the collection is an interesting interpretation of Lakme’s theme of Reinventing Nudes,” Khanna said.